2. Then set options in an appeared pop-up window which is like shown in the Figure 2. 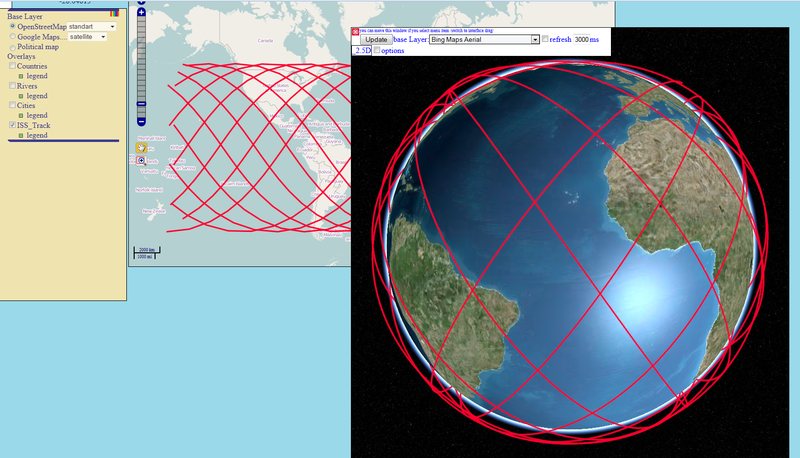 And click the button “Ok line layer” and you will see the track of International Space Station from 2014-11-29T01:20:30 to 2014-11-29T22:20:30 (UTC/GMT date in a format according to ISO8601). 3. Using standard opportunities of OpenWebGIS, you can change the layer legend with the information about the satellite track. To do this, click on the word "legend" under layer name (in this case, ISS_Track), after that under the layer name will appear the region on which you click to open the legend settings window. Set parameters of legend like in Figure 3. And click button “OK – update legend”. 4. After changing the legend you will see the track as shown in the Figure 4. 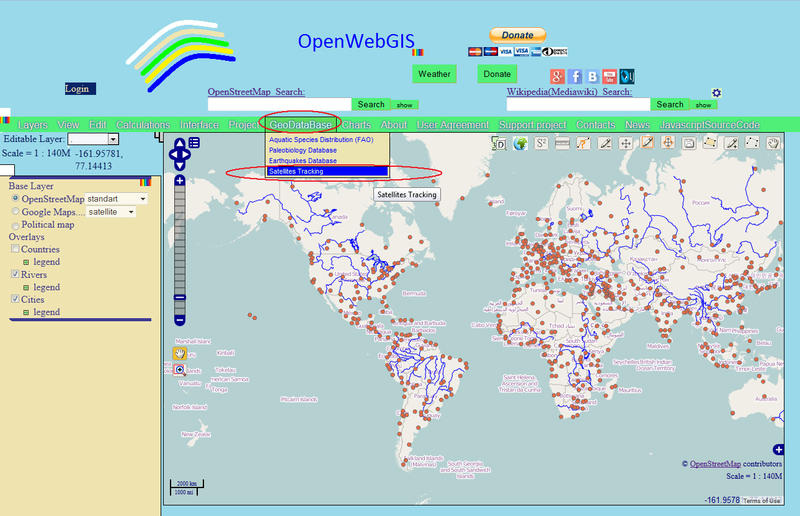 Ready map you can get from this link: http://opengis.dlinkddns.com/gis/opengis_eng.html?openwebgis=BFR027AkRhTN5RxNgK18iB7s . In this map track of International Space Station from 2014-11-29T01:20:30 to 2014-11-29T22:20:30 (UTC/GMT date in a format according to ISO8601) and position of International Space Station on 2014-11-29T18:07:48 are shown. 5. In order to open the 3D map you must first click on the button in the upper right corner of the map. This button has the title "Add 3d Map. Globe ". There will be a pop-up window in which you can set the desired options. Deactivate layers “Rivers” and “Cities” and set options of 3D as in Figure 5. 6. 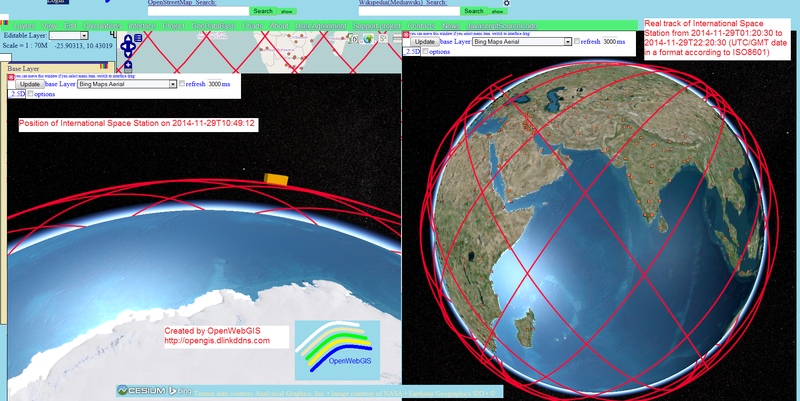 Click button OK in pop-up window with 3D options and you will get View of Earth and track of International Space Station as shown in Figure 6. 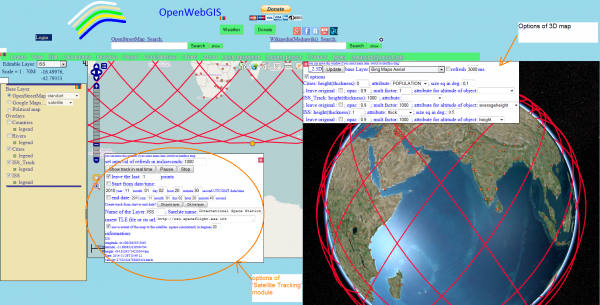 In 3D map base layer “Bing Maps Aerial” was selected. 8. 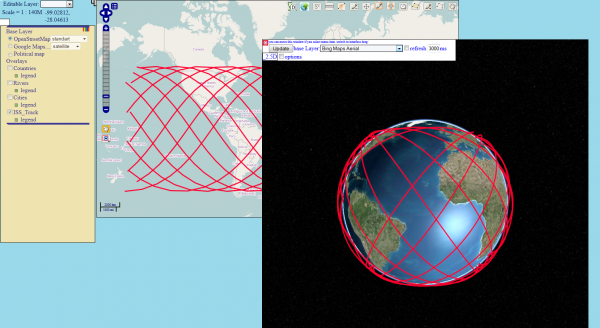 To get the position of International Space Station in real time you must set options of “Satellite Tracking” module as shown in Figure 8. 9. 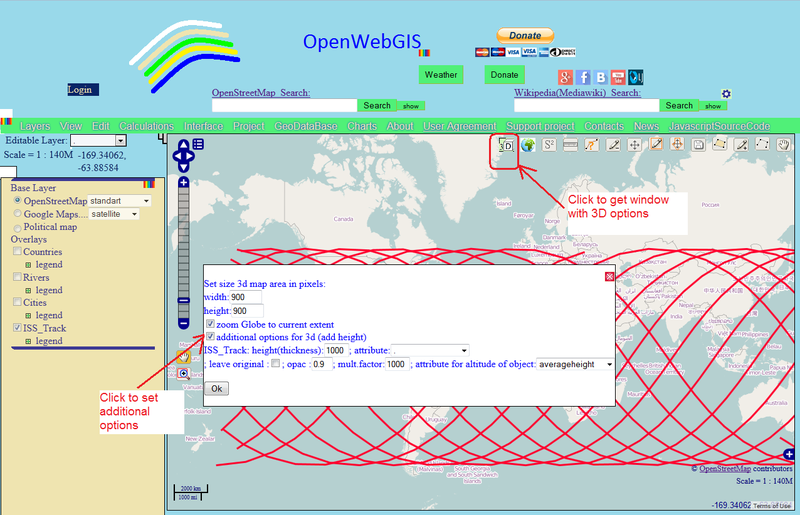 Click button “Show tack in real time” and then click button “Pause” in desired time. 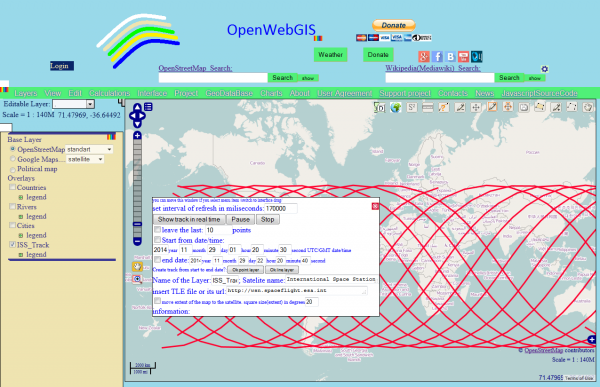 Than add additional attribute “thick” in Layer “ISS” of position (not track) of International Space Station. This attribute is necessary to give the thickness to the parallelepiped, which will represent the International Space Station на 3D карте. This attribute value is set in meters (in our case let’s set 10 000). For it select the name of the layer “ISS” in the list “Editable Layer:”, then select the menu item “Edit-> Add attribute in Layer” and in the appeared pop-up window set the parameters as shown in Figure 9. 10. After setting the thickness return to Figure 8. In order to show cities on the Globe activate the layer Cities in the list of layers on the left of the map. Then select options of the 3D map as shown in Figure 8 or Figure 10 and press the button “Update”. 11. After pressing the button “Update” and zooming and rotating the Globe you can get the view of the position and track for International Space Station as shown in Figure 11. Position of International Space Station on 2014-11-29T10:49:12 and real track of International Space Station from 2014-11-29T01:20:30 to 2014-11-29T22:20:30 (UTC/GMT date in a format according to ISO8601).